Hurray for the British Music Society! I say that with unabashed partisanship. Over many years their promotion and support of British music has been without equal and because of their sterling efforts it is possible to hear and study music of real quality that might otherwise be overlooked. A perfect example of that is this disc of Choral Music by John Joubert. It is my strong belief that Joubert’s music is still grossly undervalued. I think he has the dubious honour of being one of the most under-appreciated of living British composers. One of the great delights of the reanimation of the Lyrita label was the discovery of Joubert’s 1st Symphony (Lyrita SRCD322) and that combination of melodic flair, tonal beauty and formal control is much in evidence in his choral writing too. The more I listen to this disc the more individual his voice becomes - for any collector interested in British 20th century choral writing this is obligatory listening. This is a reissue of a recording originally made in 1975 - the BMS have labelled it “historic” which it is purely in a documentary sense - the quality of performance and recording is first rate. It is therefore a snap-shot of Joubert’s work in this field up until the mid-1970s. I would like to think that a second disc could be made as an appendix to this one - the list of compositions on the Joubert website (www.johnjoubert.org.uk) shows that he has continued to write actively for this format right up to the present. The value of this disc is much enhanced by the presence of an autobiographical note by the composer (updated in 2006) as well as his own descriptions of the chosen works. The music divides fairly evenly into works for unaccompanied choir and those accompanied with organ. Joubert favours the straight four-part SATB which gives the music a spiritual simplicity and clarity of utterance that I find most powerful. Likewise, the sources of the commissions are split between sacred and secular although the texts are in the main sacred. The most straightforward of the settings is the O Praise God in his Holiness Op.52 that opens the programme. Joubert is entertainingly self-deprecating in his note where he relates that “… my publishers considered it too light-weight … [but] … it still appeals sufficiently to me to include it here”. At less than two minutes in length it is perfectly proportioned as a curtain-raiser to any programme and must be a delight to sing. The heart and emotional core of the disc are the two major works for unaccompanied choir. The three Pro Pace Motets were written as separate pieces between 1955 and 1959. The medieval texts find a contemporary resonance for Joubert as they seek peace and hope in times of sorrow and loss. His particular skill is to have found a musical language which straddles the ages as effectively as the texts he sets. He achieves a modal timeless quality that is utterly bewitching. There is something of the fervour of Bax’s medieval settings - Mater Ora Filium and This Worldes’ Joie but with greater austerity of utterance perhaps more akin to some of Rubbra’s choral writing. I have to say though that I prefer Joubert’s music to the latter - his word setting strikes me as particularly carefully achieved with an effect that is dramatic without ever falling over into empty theatrics. The second of the unaccompanied works and probably the most powerful work here is the Sleep Canticle Op.8. This is a setting of part of Thomas Browne’s 1642 meditation on the concept of sleep as a pre-echo of death. Within the ten minute span and with the skilful marshalling of the choral resources Joubert creates a magnificent choral tone-poem as fine as anything in the repertoire and deserves to be far more widely known and performed. It is framed by a demanding tenor solo and includes an extended passage for solo soprano both of which are finely sung here. I would go as far as saying I think this is a masterpiece. The Three Hymns to St. Oswald Op.74 that follow betray their liturgical commission more obviously - they were first performed at the 1972 Three Choirs Festival. As Joubert makes clear in the notes he opted for a plainer harmonic style than the earlier motets but that is not to imagine for an instant that the settings are anything but moving and compelling. Again, I can imagine that they must be very grateful to sing with their ringing harmonies and well laid out part writing. The programme is completed by the 1968 Nowell Op.58 commissioned and first performed by the performers on this disc. 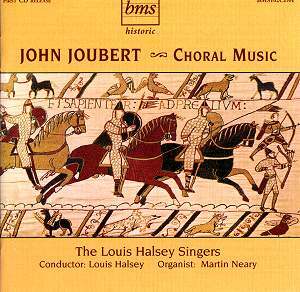 Louis Halsey was also responsible for two of the three Pro Pace Motets some twenty years before this recording. This continuing commitment to the music of Joubert ensures that these performances are as authoritative as one could hope for. I have one observation that relates to the “historical” status mentioned above. Choral singing styles have changed in the thirty or so years since this recording was made. Certainly the current preference is for a more boyish tone from the soprano line. Not that this creates any problems here but I could imagine that tonal purity suiting the style of much of Joubert’s writing even better. Only once - toward the end of the third motet Solus ad Victimam Op.29 - does the choir sound sorely stretched, the high tessitura and length of the work resulting in some choral fatigue. Martin Neary at the organ plays with all the panache and sensitivity one could hope for. The instrument is recorded slightly further behind the choir than I would ideally like as the impact of some of the dramatic organ gestures are a little lost. Overall a disc that deserves the widest possible dissemination and one that I hope inspires chorus masters and their choirs to investigate further the rich catalogue of this superb composer.